Danger looms as large scale electric power transmission may soon impinge on the the Antietam battlefield, South Mountain, and many other historic and culturally significant sites. 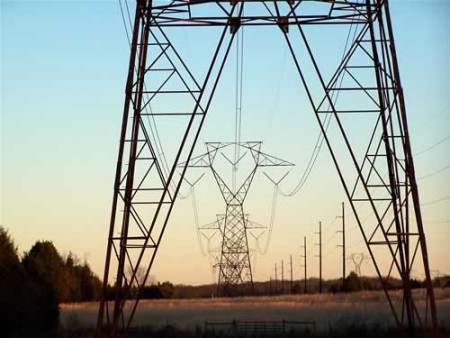 … Along the route would be hundreds of 125-foot towers with cables running in between on a corridor estimated at about 200 feet wide, said Allen Staggers, a spokesman for Allegheny Energy. Keep your eyes on this one. It looks to be on a fast track for implementation with minimum oversight. It is brought to you by to the US Department of Energy’s National Interest Electric Transmission (NIET) program and provisions in the Energy Policy Act of 2005 (pdf). The National Trust for Historic Preservation includes this proposed mid-Atlantic transmission corridor on it’s annual list of most endangered historic places, and hosts a lovely US Park Service map (pdf) of the interrelations between the NIET zones and heritage areas in the Eastern US. See also an energy industry brief (pdf) on transmission corridors and US federal policy, the Federal Energy Regulatory Commission (FERC) implementation of the Energy Policy Act, and new legislation to rein in the NEIT program.